Designs to Shine dancewear is hand constructed and completely unique. Our buyers search specialty fabric houses all around the world to find only the most beautiful fabrics. Some popular choices are chiffon which gives a very light and airy look, and charmoise a lightweight satin that moves with the body. Quite often we will purchase very small quantities of print chiffons for a more exclusive look. 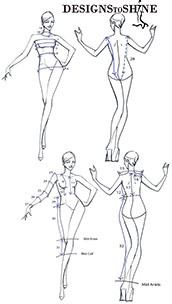 One of the many things that make Designs to Shine ballroom dancewear the best in the dance world is the incredible attention to detail. This is especially evident in the amazing embellishment of each dress. We use an astonishing variety of elements including feathers, sequins, fringe, lace and most importantly rhinestones. On average each Designs to Shine dress is embellished with over 10,000 rhinestones, one at a time. Even more amazing is our rhinestone adhesive which was formulized exclusively for Designs to Shine. Although every dress looks like a delicate work of art, they are extremely durable and made to withstand extreme dancing. Online form abuse laws do apply! Please follow instructions on the Designs to Shine measurement guide to help you fill out our online form or you can open our form in Pdf file to save it and later email it to us.